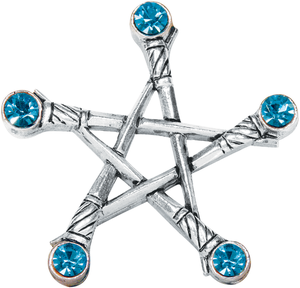 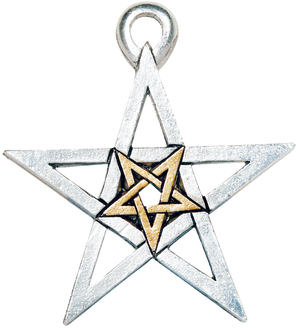 Used as an imaginary sword point to direct magickal energy towards a specific intention this unusual and very potent Pentagram is also extremely effective as a protective shield against negative energy. 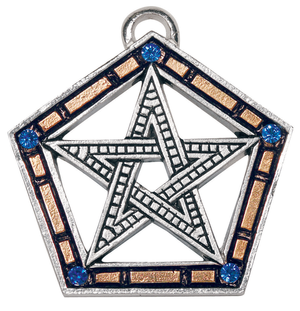 Referring to the five alphas formed by the Pentagram, and originating from Ancient Greece this unusual Pentagram was first worn by the followers of Pythagoras as a secret sign by which they could recognise each other. 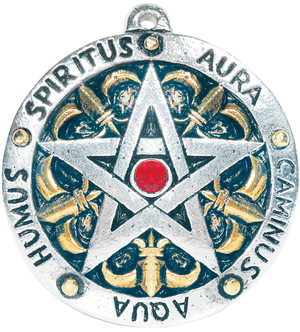 Its beautiful symmetry lends itself to acts of personal empowerment for harmony and stability. 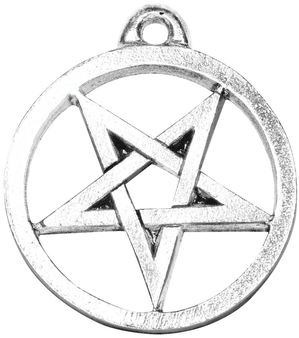 Associated only recently, since the 19th Century, with Satanists and known as the Devil’s Goat, this symbol is in fact far older and can be found in ancient Masonic Temples. 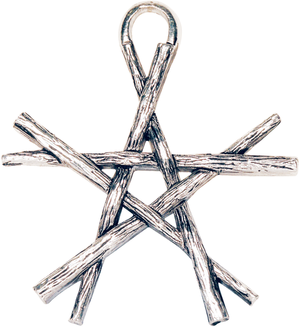 In Wicca, it is a symbol of the 2nd Degree and magickally it represents the Dog Star Sirius and can be used to channel higher energy into material manifestation. 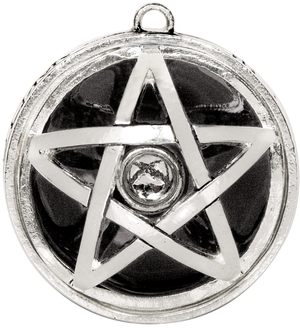 Designed to attract and channel magickal energy into the stone in the centre, the image of the Pentagram above is reflected in the domed jewel below. 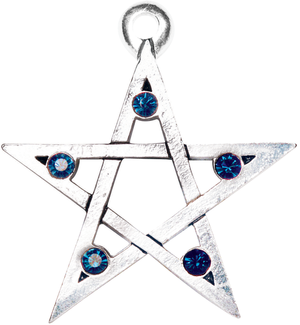 In much the same way this unique Astral Pentagram can be used to help manifest your mental visions into physical realities. 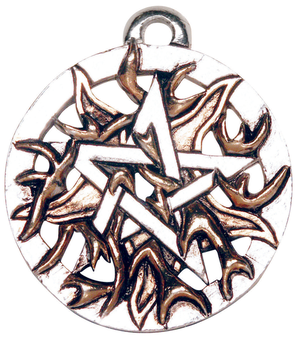 Inscribed with the elements Earth, Air, Fire, and Water written in Theban, a magickal script used by Gardnerian witches, this powerful Pentagram is encased in a binding circle. 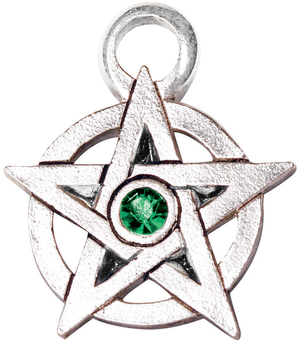 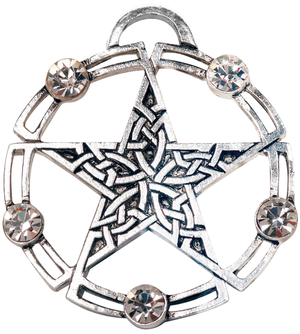 A powerful love and attraction charm with its magickal correspondence to Venus, this pentagram can also be used to harness the power of the elements. 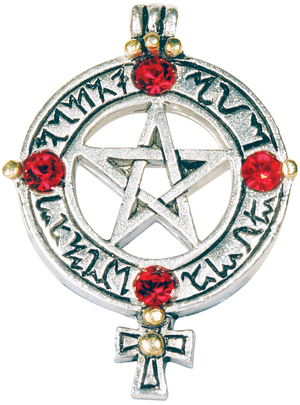 Surrounded by the five elements, written in Latin, this heraldic style Pentagram taken from the Arthurian legend of the Knight of the Round Table, Sir Gawain’s Glyph can be worn to achieve stability and inner harmony.